0	0	Am I Missing Something? In Stock - Order before 2pm for same day dispatchWant it on Tuesday 23 April? In 'Am I Missing Something? ', former News of the World journalist Ruth Roberts shares her own experiences - dear, drear and dreadful as a new Christian in a world that she found completely alien – the church. Although the people at the church she joined were generous, welcoming and full of grace she worries that Christians come across as weird, judgmental and out of touch, though she knew these opinions couldn’t be more wrong. In her book, she looks for the reason that Christians seem unable to shake off a generally negative image. For Ruth, her preconceptions changed when she spent time with church-goers during a sticky time in her life and found acceptance and compassion, rather than judgement. But negative perceptions don’t come from nowhere, and some people have had pretty bad experiences at church. "If I raise my arms in worship... how do I get them down again?" 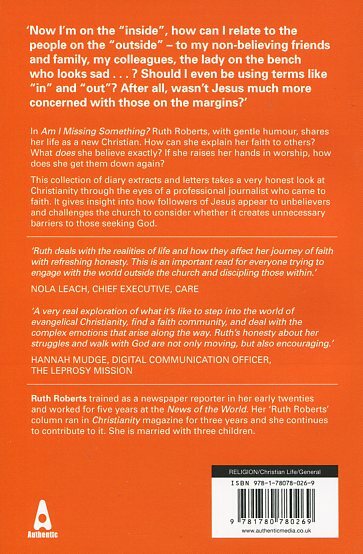 Drawn from her regular column published in Christianity magazine, and with additional material, Ruth examines the nature of her new-found belief, and her struggles to reconcile many of her own ideas with those of the church. In this humorous, touching and wholly encouraging model of love, healing, acceptance, grace and holiness she paints a picture of the community of believers which all church members – both the weird and the wonderful, aspire to create. Am I Missing Something? by Ruth Roberts was published by Authentic in March 2013 and is our 14639th best seller. The ISBN for Am I Missing Something? is 9781780780269. Reviews of Am I Missing Something? This is the sort of book I enjoy reading, finding myself nodding in agreement throughout. But I also felt very guilty reading it because some of the people Ruth refers to in the "world of church" could easily be me. Through letters and diary entries she takes a humorous yet taxing look at how we in the church behave towards – and are often seen by – people "outside". She makes you stop and think and reading this might just make some church "insiders" stop and think. She writes from the viewpoint of a new believer trying to come to terms with her new-found faith whilst having to assimilate all the "quirky" ways of church and churchgoers. So this is a book for seekers and new believers too. Many "church people" will not agree with her views on certain issues (homosexuality and attitudes towards women for example) but she clearly articulates her confusion and that of others looking in on the church. Got a question? No problem! Just click here to ask us about Am I Missing Something?. 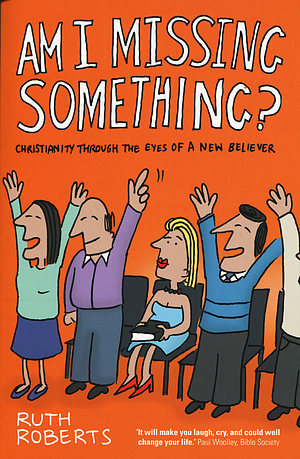 It's a weird and puzzling world we enter when we become Christians. Ruth Roberts, a journalist and media worker who at one time was on the staff of The News of the World, found church completely alien. She shares with us her own experiences in the form of 'diary excerpts' and letters to her father. Entertaining, insightful and poignant,Am I Missing Something? is very honest in revealing the culture clash between Christianity and the secular life. Ruth explores the nature of her new-found belief, and her struggles to reconcile many of her own ideas with that of the church, including the issue of homosexuality. Am I Missing Something? is based on a column which appeared in Christianity magazine, with additional material. "This book should carry a health warning. It will make you laugh, cry, and could possibly change your life. Ruth Roberts gives an enjoyable and refreshingly honest account of life as a new Christian in a lively evangelical church. Am I Missing Something? isn't down on church. Instead we're encouraged to model the love, healing,acceptance, grace and holiness to which we are called." - Paul Woolley, Executive Director, Bible Society. RUTH ROBERTS trained as a newspaper reporter in her early twenties and worked for five years at the News of the World. Her 'Ruth Roberts' column ran in Christianity magazine for 3 years and she continues to contribute to it. She is married with 3 children. Details for Am I Missing Something?